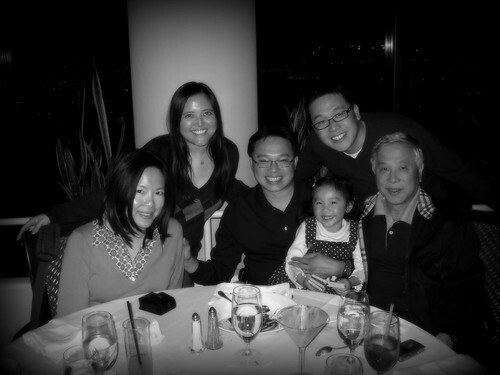 We often go to L.A. Prime for special occasions with Mr. Monkey's family. It's a fine dining establishment, but we feel comfortable bringing Little Monkey Niece. There are often other children there because it's a hotel restaurant. Some time has passed since the last time we went. The menu has changed. The flatware has changed. The china has changed. It's no longer obnoxiously emblazoned with the restaurant's name. 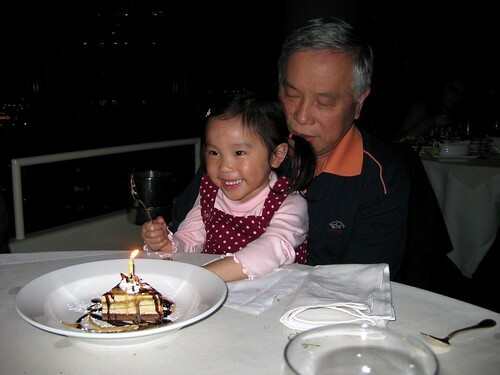 What hasn't changed is the tradition of having Little Monkey Niece blow out the birthday candle even though it's not her birthday. That's her grandpa's candle. When you're tiny, you get presents on other people's birthdays. I loved LMN's new toy. Mr. Monkey was not as amused. 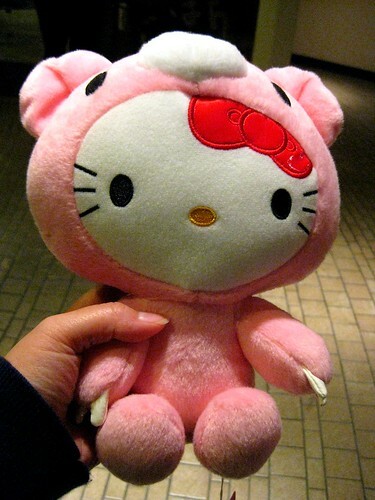 i heart hello kitty so much. my brother STILL gets presents on my birthday when we see our relatives. wtf. i'm not bitter. 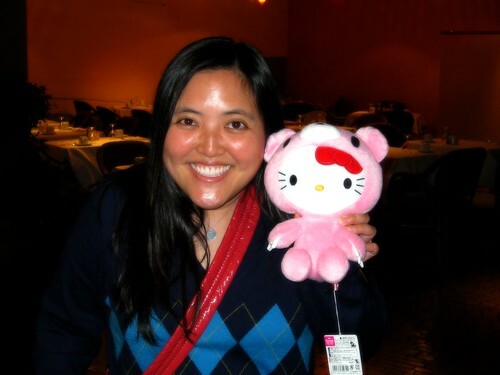 If I was personally acquainted with LMN I would have gone crazy in Tokyo with the cute gifts. My SIL was so lucky she found out she was pregnant before I went because now she is stocked. I don't know if I've ever seen mr. monkey's brother - you can definitely tell they are related! there is a store in monterey that carries a crazy collection of HK in all costumes, dresses, whatever. I think LMN would love it there. That bear is eating Hello Kitty! EEEEEK! the family resemblence in the mr. monkey family is UNCANNY. LMN getting to blow out Grandpa's candle made me cry. It's just that sweet. You're very lucky to have such a great family. 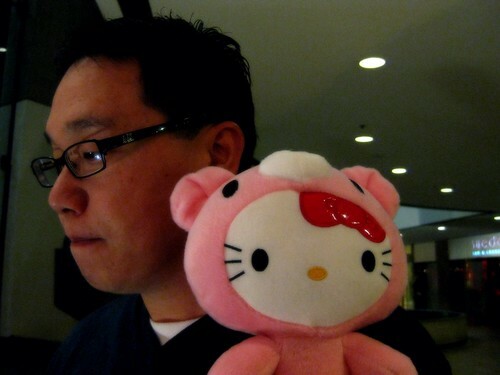 oooh where'd you get that gloomy bear hello kitty? i'm thinking i must get one for my niece! my grandparents would always give both my brother and i money on each others birthdays. we were so used to it that we didn't even realize that it was odd. What a fine looking family! And I like that HK dressed as a bear much better than my own HK dressed as a penguin. That picture of Mr. Monkey is one of my faves. when i was a kid, i always hated when the other kids got to blow out candles on my cake. it was MY effing birthday, fuckers! step off and wait your damn turn! wow, i guess i'm still a little bitter over that. Random fact: I have a tiny HK dressed as an egg hanging on my small camera :) I hated how my parents made me share my birthday cake / candle / presents with my sister. It's my birthday, dammit.